Nashville’s Major League Soccer team has hired Mike Jacobs as general manager for soccer operations. Jacobs will maintain his current position as technical director with Nashville SC of the United Soccer League and transition into his new MLS role during the 2019 season. Prior to arriving in Nashville, Jacobs was the assistant technical director for Sporting Kansas City of MLS from 2015-17. He helped oversee the club’s U.S. Open Cup Championships in 2015 and 2017, in addition to Sporting KC’s CONCACAF Champions League appearance in 2016. Jacobs also served as president of the National Soccer Coaches Association of America, the world’s largest soccer coaches’ organization, in 2016. His collegiate soccer background includes roles as head coach for the University of Evansville men’s team and assistant coach for Duke University. Monroe Carell Jr. Children’s Hospital at Vanderbilt has broken ground on a 37,500-square-foot facility that will significantly expand pediatric specialty care, outpatient surgery and imaging services to children in Rutherford and surrounding counties. The single-story facility on Garrison Drive in Murfreesboro will feature 22 multispecialty clinic rooms, after-hours/urgent care services, a suite of operating rooms, imaging capabilities such as MRI, CT and X-ray, audiology booths for hearing tests and procedural areas. Pediatric specialties that will be on site include gastroenterology, general surgery, orthopaedics, otolaryngology and audiology and urology. Children’s Hospital opened in 2016 a Vanderbilt Children’s After-Hours and Pediatric Specialty Clinic location in Murfreesboro, located on Kennedy Drive, not far from the new facility land site. The clinic provides pediatric specialty care in the areas of cardiology, neurology, general surgery, gastroenterology and urology. Children’s Hospital expects to staff the facility with about 80 employees, including doctors, nurses and additional staff with hopes to expand further in the future. Pinnacle Financial Partners is two-for-two in making FORTUNE magazine’s list of the Best Workplaces for Women. The firm earned the No. 12 spot on the list for 2018, its second year in a row to be ranked. Of Pinnacle’s more than 2,200 associates, 68 percent are women. And of 310 managers and company leaders, nearly half – 46 percent – are women. Earlier this year, Pinnacle was named the No. 22 Best Company to Work For in the country, the No. 3 Best Company to Work for in Financial Services, a Best Workplace for Millennials and one of American Banker’s Best Banks to Work For. Tennessee State University has announced new construction projects, including two new residence halls and science health facility. The dorms will cost an estimated $75.3 million and the Health Sciences Building about $38.8 million. 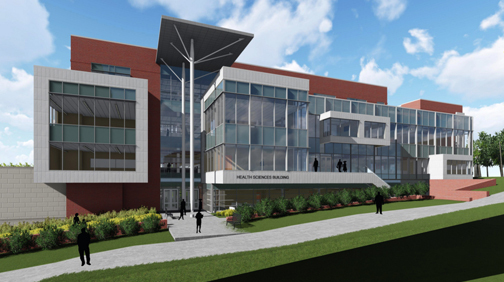 A rendering of the new health sciences building under construction on Tennessee State University’s campus. Tennessee State broke ground for all three as a part of recent homecoming activities. “The university is undergoing a renaissance of sorts; it began with our new, higher admission standards and continues with the new construction of the residence halls and Health Sciences Building for prospective students to enjoy and reap the benefits,” says TSU President Glenda Glover. The residence halls will be the first ones built on campus in 23 years. The new Health Sciences Building will be the first state-funded building built on the campus in 15 years. A new Alumni Welcome Center, the first privately funded building gifted to the University, as well as the first building to be funded by alumni, is also under construction. Earlier this year, alums Amos and Brenda Otis made a commitment to build the center. TSU’s College of Health Sciences has eight departments and more than 12 programs spread across five buildings on campus. TwelveStone Health Partners, a chronic care medication management company based in Murfreesboro, is now licensed to provide specialty and compliance packaged medications in 30 states. The company has plans to obtain licenses for all 50 states. The licensure enables the company to negotiate specialty payer contracts, which often require national licensure before allowing the provider into the network, as well as provide specialty and compliance packaged medications across state lines and to enable deployment of the company’s delivery tracking software. The company began pursuing the licensure process in April and plans to expand to all 50 states within the next six months. Chronic disease, or ailments that persist for a long period of time, affects half of all Americans. Treating and managing chronic disease account for 86 percent of the nation’s $3 trillion spent on healthcare. The Carlstar Group, based in Franklin, has announced the company has partnered with Gradifi to offer a student loan repayment benefit to its U.S. employees. The Carlstar Group is an industry leader of specialty tires and wheels and employs more than 3,400 associates in 17 facilities located in four countries. The benefit began Nov. 1. The Carlstar Group will supplement eligible employees’ regular student loan payments with a monthly contribution through a managed program. Bright Health is expanding its Innovative Care Partner Health Plan Model to the Nashville, Knoxville and Memphis regions. Bright Health will offer individual and family plans in those areas. Nashville area seniors will also be offered Medicare Advantage with prescription drug coverage plans. The company’s health plans feature partnerships with Baptist Memorial Health Care in Memphis, TriStar Health in Nashville and The University of Tennessee Medical Center in Knoxville. “Bright Health is committed to expanding access to the growing number of people in need of individual health plans and quality healthcare – both in Tennessee and across the country,” says Bob Sheehy, Bright Health’s co-founder and chief executive officer. Stoneridge Farms at the Hunt Club in Gallatin has been acquired by Security Properties and ReCap, a Reinsurance Group of America company. The 364-unit, Class-B+ garden-style community was purchased for $55,000,000 and is Security Properties’ sixth acquisition in the Nashville MSA. The property represents a value-add investment with heavy renovation upside. The units at Stoneridge Farms offer a mix of 1x1, 2x1, 2x2 and 3x2 floorplans. The property will be managed by Security Properties-affiliate Security Properties Residential. Nashville-based HealthStream, Inc. a provider of workforce and provider solutions for the healthcare industry, has announced its third-quarter results for the period that ended on September 30. Revenues of $59.9 million in the third quarter were up 9% from $54.7 million in the third quarter of 2017 with $634,000 positive impact in the third quarter of 2018 from the application of rule ASC 606 accounting standards. Income from continuing operations of $3.0 million in the third quarter of 2018, up 75% from $1.7 million in the third quarter of 2017 with $819,000 positive impact from ASC 606.